I knew when I signed up for a half marathon in January that training during the winter in Denver would be difficult. Cold weather, possible snow, darker days…I didn’t even factor in the holidays. Whoopsy! Perhaps the hardest lesson for me to learn was that training in the morning before work is super beneficial this time of year (and probably year round, I wouldn’t really know). Getting up early is painful for me, even when it’s not dark and cold outside, but I found that evening workouts are much more prone to cancellations- work happy hours, having to stay late at work, holiday engagements, feeling too tired/hungry/unmotivated at the end of the day all tend to get in the way. Plus, I tended to feel better at work on days that I got up early to work out. Another thing I learned is that if you dress appropriately you can run in some pretty cold temps. So no more excuses for cancelling runs when it gets nippy outside (but be realistic, running in sub zero temps is not recommended). To come up with a list of top training tips I consulted with the best runner I know (who just so happens to be my sister), Kim Dobson (see: Pikes Peak Ascent Female record holder http://www.pikespeakmarathon.org/results.htm) to get her advice on how to have a successful half. The tips mostly apply for other distances as well. Here are our recommendations. • Make or use an appropriate training plan to guide your training. Even if you are pretty knowledgeable about what your training should look like it will help you stay on track if you have it pre-planned and written down. If you are a novice a 12 week training program should be sufficient to get you to the finish line, assuming some base cardiovascular fitness. • In that training schedule include a weekly long run and a tempo run. Remember to build slowly towards the long run depending on what your base fitness is. If you are a newbie, your “long run” might be 5 miles. Tempo runs should be pleasantly challenging, typically just shy of race pace. Use tempo runs to visualize yourself in your upcoming race, fighting through the pain and fatigue. • Reduce your weekly mileage every 3-4 weeks for one week to allow your body to recover and adapt from training. Think of these as “easy weeks” not off weeks. • If something hurts while you run, take a day or two off. You might be able to do some low impact cross training like the elliptical or even yoga and core work instead. Listen to your body. Runners tend to have a hard time resting, but think of it this way-it’s either a little rest now or a lot of rest later when you really injure yourself. • Run a 10K in the middle of your training block for motivation and to see where your running fitness is at. It will also help you adjust to race atmosphere. • Be a part of your local running community- attend run clubs, run with friends, use social media (Facebook, Strava), read running magazines etc. This will help you stay motivated and make it fun! • Practice your nutrition strategies during training runs. Experiment with different products until you find the ones that work best for you. For a half marathon distance you will likely need some sort of carbohydrate supplement during your race. • Invest in the proper recovery tools-I’m talking foam rollers (I recommend Trigger Point), ice packs etc. Make sure to stretch after all runs. • Taper. Your longest training run should be about 2 weeks before the actual race. You can focus somewhat on shorter, faster runs during this time but the actual week before the race should be pretty low mileage and intensity. • Consider carb loading. This one could be a blog topic in of itself! Half marathons are kind of on the border of necessitating carb loading, depending on how long you think the race will take you. It could be helpful to focus on a higher carb intake for the 2-3 days before the race. Don’t rely on a giant pasta dinner the night before, it will likely just give you a stomach ache and wont’ really help your performance. Stick with carbs that are familiar to your body. 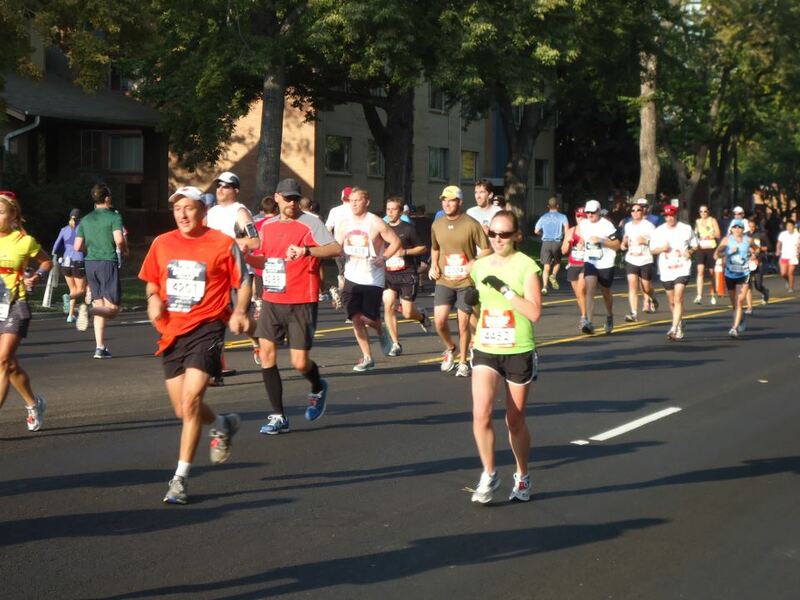 • Arrive at the race with plenty of time to get ready-warm up, stretch, use the restroom, and get to the start line. (We recommend one hour before the start). • Also make sure to get up early enough to get in a proper breakfast and digest it. This means you may have to get up pretty early; typically you need about 2 hours pre-race to digest the meal. Some athletes will even get up, eat, then go back to sleep for a bit. Make sure it’s a familiar breakfast; this isn’t the time to try that new breakfast burrito you heard about! It should contain mostly carbohydrate with some protein/fat. My go to is whole wheat toast with peanut butter and honey. • If it is cool outside, wear warm clothes and stay warm until as close to the race as possible. Be careful not to overdress for the actual race though as over-heating can slow you down. Consider gloves. Cold hands are no fun, and they can also serve as a place to stash your energy gels. • Wear familiar socks and shoes (ones that you have completed long training runs in). • Think of the first mile as a warm up and ease into the race. It’s better to start conservative and speed up as you go then to start out too fast and have to slow down…or stop. • Break the race into thirds or fourths (so 3 or 4 mile increments for a half marathon). At the end of a section, have a general idea of what time you should be at and give yourself a pep talk. Try to push a little harder at the start of a new section. • Use water stations as “breaks”. This doesn’t mean you stop, it means you slow down just a bit to give your body a brief rest and to properly hydrate. Speed up as you leave the water station. • Focus on passing people the second half of the race. Pick a person ahead of you and slowly work to catch up and pass them. • Expect that the race is going to hurt, and be ready to stay mentally tough when your body tells you to slow down. One of Kim’s favorite running quotes, by Dr. Stan Beecham (via Greg McMillan in a Running Times magazine), is “You ain’t gonna get out of the race pain-free so you gotta pick the pain — the pain of the race or the pain of regret.” Our bodies are capable of so much more than we know, if we are willing to push ourselves. • If you find yourself struggling utilize the power of positive thinking. Get a mantra in your head such as “I feel fast, my legs feel strong”. It doesn’t have to be long or complicated to help. • Don’t underestimate the importance of post-race recovery nutrition. This too could be it’s own blog topic (and maybe it will!) Basically you need mostly carbs with some protein as well; ideally within 30 minutes of finishing your race. ← Coffee: Is it Good or Bad for Your Health and Sports Performance (or Just Delicious)?